How has your Japanese culture and heritage influenced your work as a designer? I think that being born in Japan has, to a certain extent, had an influence on my sensibility. For example, I have the idea inside of me that I feel it is strongly Japanese, to "anthropomorphise" inanimate objects. I define clothes as the most familiar 'others'. The reason is that I feel clothes are identities that have lost their bodies. Clothes are actually seeking the real feeling of living and life themselves; that is, they are in search of a body. This idea of clothes as a subject and as having subjectivity is quite natural for me, but I recognise it is a strange idea when I think about it carefully. I have been anthropomorphising clothing right from the beginning. When we look back into the past, we can see that the Japanese have made great use of anthropomorphism since ancient times. Even our national treasure painted in the Heian period, Choju-giga, also referred to as the ‘Scrolls of Frolicking Animals’, depicts illustrations of animals behaving like humans. Furthermore, I think that "Yokai", Japanese monsters or ghosts, are essentially anthropomorphic ethical or cultural concepts. Anthropomorphism is perhaps a specifically Japanese way of recognising the existence of spirit in the universe. Why do you think fashion is an effective medium for communicating social, cultural and political messages? The reason why I think clothing is an effective communication medium is because it is a medium that records the unique human culture of individuals and groups. I define fashion as an atmosphere created because of an individual's successive value judgments. Let's think about indigenous clothing. There are times when we are not sure how it is worn or there may be parts of the clothing that make us question what they were designed for. However, the body is a common language that we all share. It may be an indigenous piece of clothing, but by wearing it and living in it, we are able to experience the cultural collective unconscious and hidden thoughts inherent in that clothing. We can refer to clothing as a musical communication medium that harmonises as another person on the body. On the other hand, it is precisely because we have the body as a common language that allows us to see examples of different values, like how women with monobrows can be seen as beautiful in one culture and plump women are considered beautiful in another. These values are meaningful in a historical context. Realising the variance in these values has helped me manifest my own beliefs and lead me to fascinating discoveries. Fashion creates meaning, and places value on the body from many angles. How should we define the body in its relationship with the environment? This is exactly why fashion is intriguing. 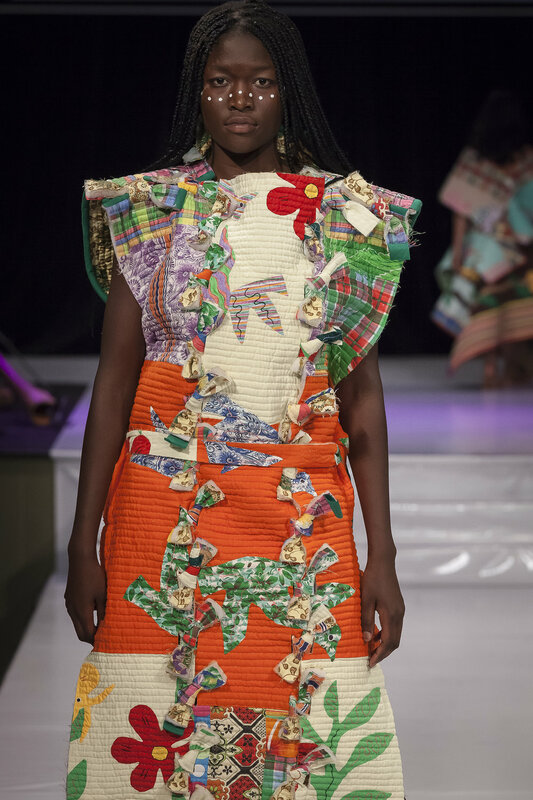 Your designs on last year's EFWA runway looked like moving art installations. Can you explain to us what your message was behind these more experimental pieces? An item may be thought of as meaningless, but there might be an important meaning to its existence. A sculpture may look completely useless at first glance, but it may be concealing some form of art. Furthermore, things that we humans consider useless may be a necessity to plants and animals. Things that we humans regard as ugly may be beautiful to other creatures. I think it is important for us to rethink everything by distancing ourselves from our habitual evaluation standards. That was the message behind my work from last year. Moreover, I have always had an interest in harmonizing the decorative aspect and functionality. Decoration, or the ornamental, is generally perceived as "useless beauty". But I want to regard decoration in a more positive way. The functional beauty that was made famous by Bauhaus headed towards eliminating the decorative element. I, on the other hand, think about the decorative aspect of function. Recently, I have been designing with this idea of 'function turned into decoration" in mind. What kinds of materials do you like to work with and what kinds of design processes do you use? I like to work with pure materials because I would like to pursue designs that make use of the charm and potential of the material itself. My work is formed by me constantly tapping in and out of four processes: Research, Questioning, Concept, and Design. In the Research stage, I find out about existing eco-designs and ecosystems. I do not know anything about ecology, but without biting off more than I can chew, I start by doing what I can. In the Questioning stage, I raise questions and attempt to reset preconceived ideas. The first step was to clear out the conventional image of clothing that lives deep inside me. I think of myself as a primitive living in a city and raise questions as to how clothing should be. As for Concept, I analyze a design's core idea through words and metaphors, with an emphasis on poetic expressions and sense. And for Design, I look at ways to bring my concepts to life. I would usually prepare and examine mock-ups of small pieces of clothing before starting on the full-scale piece. This is probably similar to the process of product design. Can you tell me why it's so important to communicate environmental messages about nature through the clothes we wear? I think that in the days to come, we will uncover great beauty from the way we face ecology and ecological solutions. That is why it is important to create things that interact with our natural environment. Our bodies are also a part of nature. As a matter of fact, it seems like our bodies are continuously storing food and matter present in the air that cannot be decomposed. Our bodies are filters that accumulate junk. In other words, our bodies will not be able to fully decompose when we die. But what can we say about clothes? Clothing can decompose completely as long as we make them from biodegradable materials. This has led me to think that if my body cannot be fully decomposed, I should at least make clothes that do. When I was thinking about the body's life cycle, I came to look at it from an ecological point of view. To wear clothing is to interact with our bodies and lives. Or perhaps it is an interaction with the awareness and values of a culture system. Clothing in the 21st century, which may well be the century of ecology, will reflect various ecological thoughts derived from interacting with the environment. What can we look forward to at this year's Eco Fashion Week Australia 18 (EFWA18)? This year I will continue deepening the "function turned into decoration" idea that I introduced last year. The theme of my new work, to be announced at EFWA2018, is "The Claws of Clothes". I regard clothes as a kind of life form, and express the process by which clothes evolve while changing form. If garments are considered life forms, what are the claws of a piece of clothing? If clothing had claws, how would this change their state of existence? This idea was brought about by Professor Shinji Hirai and his team at Muroran Institute of Technology, and their research into "protein resin". By compressing wool cloth while applying heat to it, the keratin contained in the wool becomes a resin. (Keratin is the same protein in nails or claws.) This is an animal resin, and is biodegradable. This material has great potential. 'Art as activism, mindful making and connecting to cloth for consciousness' says Jane Ziemons, designer behind 'Melaleuca Rise'.